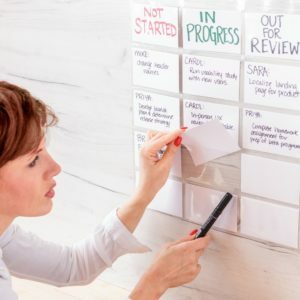 Index Card Binder Sheets Alternative? Are you looking for index card binder sheets? Based on my research, most consumers want a poly sheet that can fit in a three-ring binder that allows them to flip through and see between 4 – 8 cards at a time. And they work great for exactly what their intended purpose is – storage. But for some consumers, they buy binders and plastic sheets because they don’t know of other alternatives or solutions. Binders require you to physically flip through them to find what you need. If you have to do this a lot, it could waste a lot of time and be quite tedious. Now imagine, what if you could make your index cards or photos visible, easily accessible and completely hands-free. Is that interesting? When I was learning how to program, I made a HUGE stack of notecards that had a lot of great learnings… but anytime I wanted to retrieve that information, I had to find the stack, pick it up, and sift through it until I found the one card I was thinking about. You may have the same problem with index card binders and plastic sheets. But, it really depends on what you’re using it for. Binders can be great for photo albums or preserving items long-term. 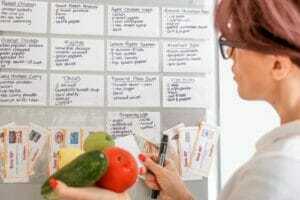 Binders can be a pain if you’re intending to use index cards and sheets for studying, recipes or meal-planning. Basically, if you are going to need to retrieve the information on a FREQUENT basis, you might consider a different option. Like our ProSimpli index card organizer of course! OK, yes, you are on the ProSimpli website and of course we’re going to suggest our product. But our product really is a great alternative to storing index cards in binder sheets! 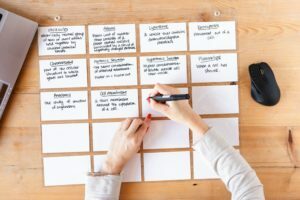 If you need to make recipe cards, study notes, or notes that you will commonly want to look at, placing your index cards in our sleeves instead of in a binder will give you the ability to get the information faster, hands-free, and more-often. Our product is easy to hang (2 pushpins) and can hold up to 20 index cards. It’s super-clear and has many other uses like: meal-planning, toddler’s room, office cubicle, child’s classroom, studying. Without citing a bunch of research, let’s just appeal to common sense for a minute. If you SEE the things you’d like to learn REGULARLY, are you MORE or LESS likely to learn it? If you said MORE, you are correct. And it’s common-sense. But ultimately, whatever you’re trying to place in a binder sheet, you now know you have an alternative. Thanks for reading! Comment below and let us know what you think. Place on your refrigerator and your children and you will never have to brainstorm what to have for dinner each night!